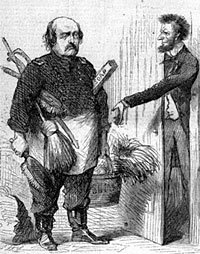 Benjamin Butler AKA “Spoons” and “Beast” was a War Democrat who supported John Breckinridge for President in 1860 after earlier supporting Jefferson Davis for the Democratic nomination. 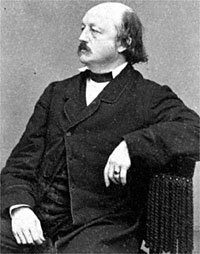 Butler ran unsuccessfully for governor of Massachusetts in 1860 as a Breckinridge Democrat. After the fall of Fort Sumter, he became a Brigadier General of the Massachusetts militia and subsequently took military control of Baltimore in May 1861. His peremptory exercise of authority led to his removal by Gen. Winfield Scott to Fort Monroe. 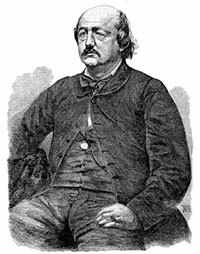 There, his seizure of three runaway slaves as “contraband” led to a crisis about the government’s treatment of escaped slaves and a growing reputation as a radical. 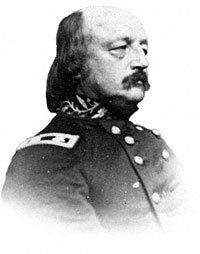 Butler later served in Union commands in Louisiana where he took over after the capture of New Orleans in April 1862 and was a tough, effective and controversial military governor who was nicknamed “Beast Butler.” He was frequently surrounded by the aura of corruption although his personal involvement was never proven. 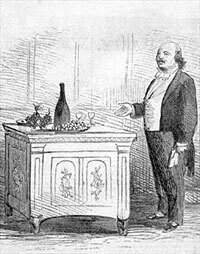 Self-absorbed and self-aggrandizing, he was an ambitious bundle of contradictions. Butler went from opposing black soldiers to using them in the army. In 1863, he was named to command the Department of Virginia and North Carolina and in 1864 he was put in charge of Union efforts to control potential Election Day riots in New York City. 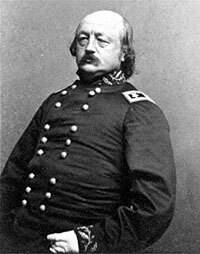 He was more effective as a military governor than as a general—bungling both the defense of Bermuda Hundred in Virginia and the attack on Fort Fisher in North Carolina in December 1864. After the Civil War, Butler served as a Radical Republican (1867-75) and a Greenback (1882-83) in Congress, Democratic Governor of Massachusetts (1883-84) and Greenback Party candidate for President in 1884. During the impeachment trial of Andrew Johnson, he served as one of seven House impeachment managers. Thomas J. Goss, The War within the Union High Command: Politics and Generalship During the Civil War, pp. 25-26. Goss, The War within the Union High Command: Politics and Generalship During the Civil War, p. 45. Benjamin Butler, Private and official correspondence of Gen. Benjamin F. Butler, Volume I, p. 116 (Letter from Montgomery Blair to General Benjamin Butler from Montgomery Blair, approximately May 29, 1861). William O. Stoddard, Jr., editor, Lincoln’s Third Secretary, p. 153. Allan Nevins, The War for the Union: The Organized War to Victory, Volume III, p. 14. Allan Nevins, The War for the Union: War Becomes Revolution, 1862-1863, Volume II, p.194. Richard West, Jr., Lincoln’s Scapegoat General: A Life of Benjamin F. Butler, 1818-1893, p. 206. 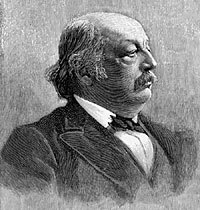 West, Lincoln’s Scapegoat General: A Life of Benjamin F. Butler, 1818-1893, p. 291 (General Order No. 1, January 7, 1865). William C. Harris, With Charity for All, Lincoln and the Restoration of the Union, p. 255.